Coaching is a discipline that requires a harmony between body and mind. To stay in tune with my clients I am continually reading and re-reading books that help me understand and connect with them. 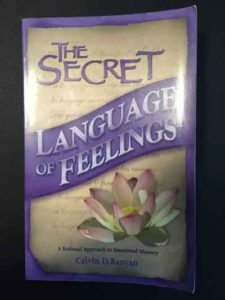 This book, The Secret Language of Feelings A Rational Approach to Emotional Mastery by Cal Banyan is truly amazing. Banyan uses his years of experience as a hypnotherapist to define the types of “bad” feelings we often experience in our lives. His insight into how we distract ourselves to avoid emotional discomfort and how we can use simple methods to overcome the cycle of distraction and frustration are simple, easy-to-use, and based on real human actions. The biggest takeaway from his book is that unmet needs that are treated with distractions lead to frustration. From un-discharged frustration we learn to give up and begin feeling depressed. When a client comes to me to discuss how to make a change, I listen carefully to find out more about when, where, and how they might have “bad” feelings and using Banyan’s model we can uncover and speak about any unmet needs. In many cases getting to the core emotional need can free up a lot of mental bandwidth and create an opportunity to move on to new things. Banyan views emotional states as “Wisdom” and he methodically explores the wisdom of feeling Bored, Angry, Guilty, Sad, Lonely, Inadequate, Stressed, & Fearful. He also talks about the Wisdom of trying to distract ourselves, and how that leads to feeling Frustrated, and possibly Depressed. He also speaks to Sympathy, and how to recognize when we are using it appropriately. What is especially valuable is the self-coaching components at the end of each chapter. When I first read this book in the early 2000’s I was not in a good emotional place to use the tools. If I had been meeting regularly with a coach or hypnotherapist that might have helped – however much of it was related to my life circumstances and what I could do based on who I was then. If you are in a situation where you have an opportunity and want to learn how to manage your feelings and understand other people when they are having “bad” emotions, this book is miraculous.